South Lake Union isn’t exactly known for its bustling nightlife — the neighborhood virtually shuts down when its thousands of tech workers head home for the night. But Oct. 11-14, it’ll light up the night sky: Borealis, a Festival of Light, billed as the United States’ first international video projection mapping competition, is coming to the Museum of History & Industry. Or, at least, it’s coming to MOHAI’s exterior. Four times a night starting at 6:30 p.m., art by competing artists and groups from around the world will be projected onto the building’s columned facade. The entire festival — which also includes around two dozen art installations — is free to attend (though you need to reserve tickets to view the video-mapping showcase). But what exactly is video projection mapping? If you haven’t heard of it, you’re not alone. 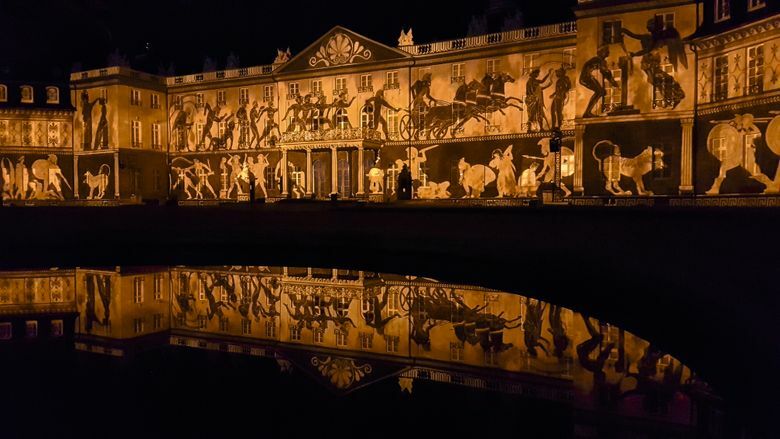 While millions of people annually attend Fête des Lumières, Europe’s largest light festival and video projection-mapping competition, the art form hasn’t quite caught on in the United States (outside of a few noncompetition festivals and, of course, Burning Man). Chicago-based artist George Berlin, the only U.S. artist chosen to compete in Borealis, describes projection mapping as “like if you could watch TV on a building”: animations, set to music, projected onto a structure. But the building isn’t just a blank canvas: its architecture, to varying degrees, figures into the artists’ work. That architectural focus might be part of why the art form is so popular in Europe while being almost unheard-of in the United States, according to festival organizers — our buildings are sparse and our walking room is little. Luckily, MOHAI’s 5,000-square-foot facade and plentiful grassy standing space nearby provide an exception; but surely it isn’t the only building in the country that fits the bill. And Seattle isn’t the first city that comes to mind for pleasant October festival weather. So why here? Like it or not, the city has become irrevocably associated with the tech industry. Where better to hold a festival fusing technology with art and architecture than in the artsier version of Silicon Valley? “Seattle’s kind of a premier hub for technology and art. It seemed like kind of a natural choice,” said Terry Morgan, co-founder of Borealis and CEO of Modern Enterprises LLC, a Seattle-based event-management company. If you’re not sold on light art alone, Borealis also includes musical performances, food trucks, and a beer and wine garden. Music begins at 5 p.m. (perfect for enticing the post-work crowd), and art installations open at 6 p.m. The festival shuts down at 10 p.m. each night. Among the roughly two dozen art installations that aren’t involved in the competition, don’t miss Seattle artist Maja Petric’s “We Are All Made of Light,” which uses artificial intelligence to display visitors as paths of light and sound, and Chicago-based Patchy Projects’ “Paint Roller Remix,” where visitors will use paint rollers to uncover psychedelic animations (including some by competition artist George Berlin). Virtually the entire festival is outdoors, so don’t forget to dress for the weather. But don’t let a little rain stop you. South Lake Union may never again stay up this late. Zoe Sayler: zoe.neile.sayler@gmail.com; on Twitter @zoe_sayler.